Always be yourself…unless you can be a unicorn. Then always be a unicorn. Look, we don’t wanna make any grandiose, outlandish statements, but unicorns are basically the most beautiful, magical, amazing, ridiculously fantastic creatures in the entire existence of this and any other universe. Think about it! If the legends are true - and they definitely are - then their bodies are full of blood that looks and feels and acts like silver, which has the kind of magical power to literally bring someone to life. Dragons can’t do that! And unicorn horns are also the most magical thing in the universe, possessing untold magical healing properties. And that’s just the pesky health and spell stuff- we’re not even talking about how beautiful and gentle and just out-right cool they are. Did you ever know someone who was total jerk loser who rode around on a unicorn? No, you haven’t, because unicorns have fantastic taste in people and usually only hang out with the coolest, bravest, nicest, and best-looking heroes in all the land. They also can find rainbows and the lushest places in the forest and the coolest watering holes and if you’re lucky, sometimes they’ll grow wings and take you on a first-class ride up to the sky! So this Halloween, class your game up and be the thing everyone else wants to be by dressing up in his Adult Unicorn Costume. 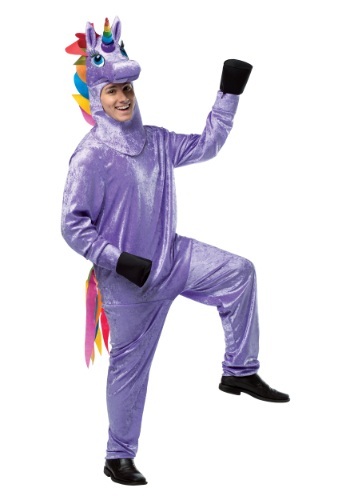 In this one piece jumpsuit with attached "hoof" hand covers and a slip-on hood featuring a rainbow mane and plush horn, you'll be spreading rainbows and magic all over the dang place!